NEW 'Anti Corrosion' sealed packaging! 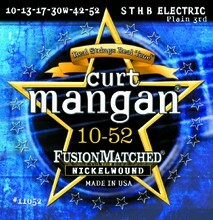 Curt Mangan Fusion Matched Nickel Wound Electric Guitar Strings. Located in Cortez, Colorado USA, the Curt Mangan string factory builds over 400 boutique, premium quality single strings and 250 packaged sets for acoustic, electric and classical guitar, acoustic and electric bass guitar, mandolin, banjo, bajo sexto and quinto, plus other instruments with hand-crafted-pride. The company takes pride in being a "small company' dedicated to making great strings with "big tone." The company also enjoys the personal contact they have with their customers. Many players believe Curt Mangan® FusionMatched® strings are the best guitar strings ever made. Since launching the company in 2004, Curt Mangan® FusionMatched® strings are available in over 1,000 USA independent retailers, 20 countries and are used by more than 800 artists. The company was founded by Curt Mangan who has a 50-year history with the guitar. He still plays and records professionally as he has for over 40-years. His experience includes working at and owning music stores, building and repairing guitars, teaching lessons and he was Director of Sales and Marketing for one of the world’s largest string companies for seventeen years. Curt Mangan® FusionMatched® strings were developed from the ground up and from a player's perspective. Every batch of Curt Mangan® strings is play-tested to make sure they feel and sound great.